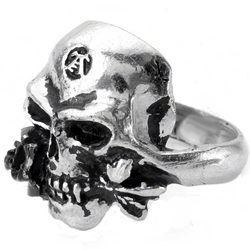 The Demi Alchemist ring features a classic portrayal of the Alchemist, with black rose in its mouth. This Gothic ring is hand cast from fine English pewter and in many cases, including high quality materials and finishes. An advantage of this pewter Demi Alchemist ring is that it does not need regular polishing to maintain its gorgeous appearance. Pewter jewelry does not tarnish like silver jewelry. To keep your gothic Demi Alchemist ring bright and shiny, an occasional cleaning with a quality proprietary metal polish will keep it looking brilliant. This pewter gothic ring is made in Sheffield, England and crafted by master craftsman.